After gorging oneself at The Smörgåsbord, you end up nearly delirious. It's called the food coma, and often involves a wee nap directly after the meal. It can be one of the most blissful set of moments you can gather into the one space at the same time. 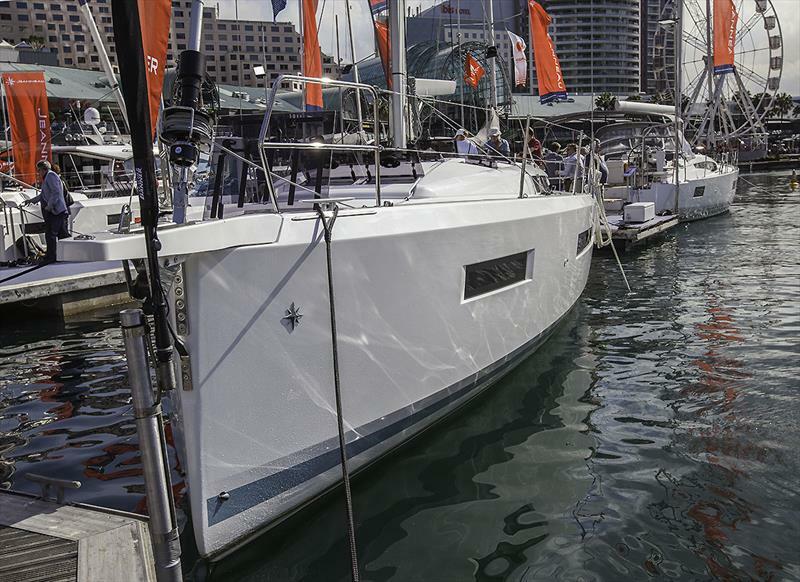 Now a few weeks ago we pondered what the upcoming Sydney International Boat Show would offer the cruising market. The answer was a lot! Sailing a few of the craft immediately after the event was undoubtedly one of the highlights, as well. 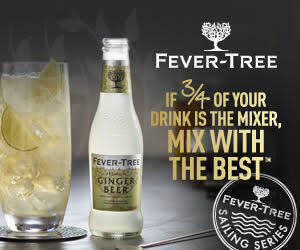 So look out for our full reviews of them in the next little while. Equally, more than a couple of craft were hastily readied for display, after only having arrived by ship just a few days before having to be installed into the 'pop-up' marina deep in Cockle Bay. We are to go out on those in the next little while as well, so that too will be more reading to come along the way. It was hard not to miss the Jeanneau Sun Odyssey 490, given the way it was installed just to the left of the main access ramp. Yet it was her Philippe Briand penned lines that were even more striking. 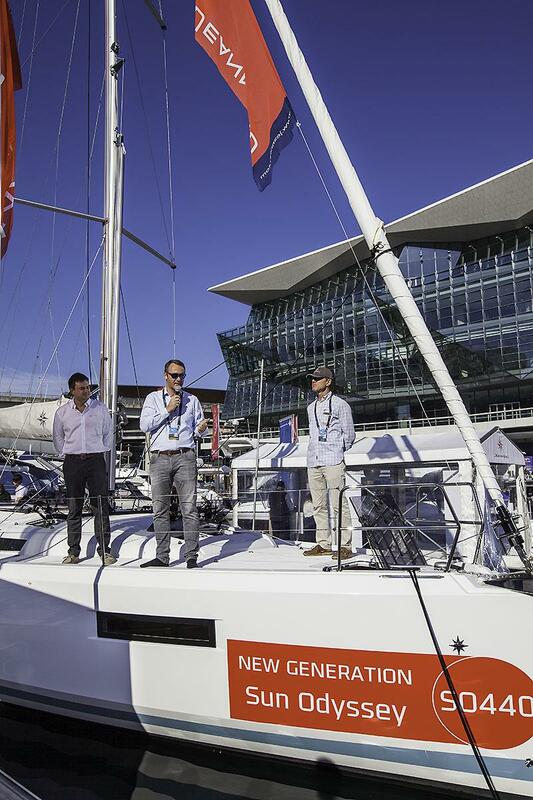 Her smaller sister, the 440 was right next door, and it was from her foredeck that Jeanneau's Antoine Chancelier espoused the grand theory behind the innovation for the new generation of Jeanneau Sun Odysseys, and they really are something. With the super-recent arrival of the Marc Lombard penned Sun Odyssey 410, Jeanneau have a powerful line up from 40 to 47 feet. 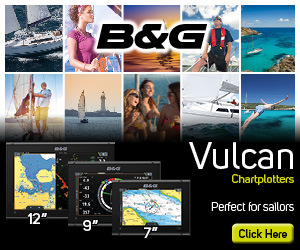 So for those looking for something more than a regulation white boat, I can only imagine that the Jeanneau dealers will be busy for some time to come. 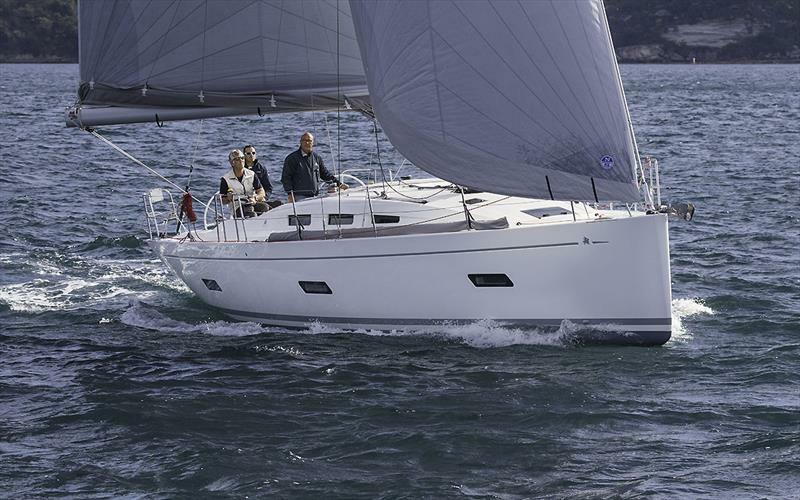 The very new Bavaria C45 Style was another new craft from a new generation of vessels on display, and Ensign Ship Brokers ended up selling her at the show. So one lucky person outside of Europe now owns a very rare beast indeed. Her lines from Maurizio Cossutti and his team are magnificent, and she offers good performance and also amenity. Hopefully the production will commence again very soon, and more sailors can enjoy the C Line from Bavaria. Multihull Central displayed the Corsair trimarans, and I can really see how they can work as short stay, fast paced family weekenders or perhaps a few days more. Brilliant, and affordable. Also easily transported on a trailer, so you can explore different waters, these craft have good space for their overall size. 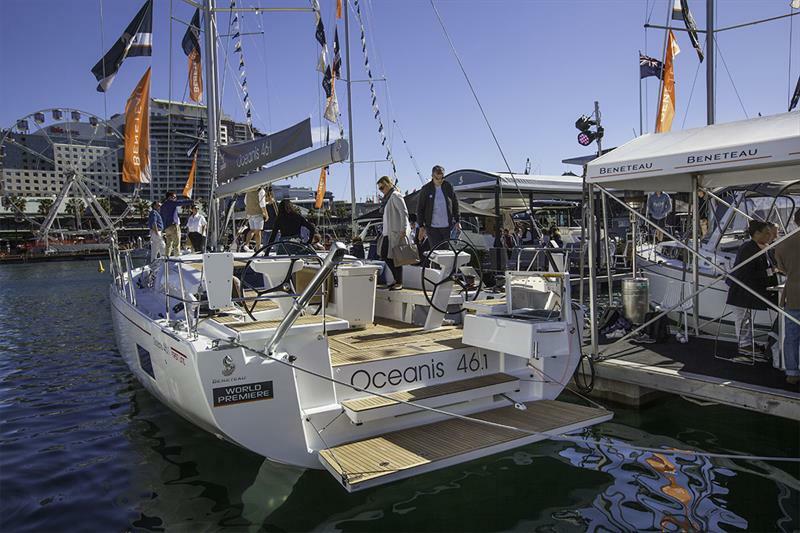 Damien Jacob from Beneteau was in Sydney for the World Premiere of the ultra-new Oceanis 46.1. Like a lot of boats at the show, she had not even had time after being taken off the ship for her antifoul to be applied. Her stick was to come out again to be installed completely, and then North Sails were to come and complete their measurements ready to supply her wardrobe. All the while her proud new owner beamed on. A patient man, it would be a little while before he and anyone else could go for a blast. Preliminary polars for the big rig and deep keel version would indicate that in a blow she can make nearly 8.5 knots at 40TWA and climb to what is essentially 18 knots at 150TWA. Like wow! Damien has the poker face of all poker faces, but I could tell he was proud. Since Gianguido Girotti (G3) secured him onto his team, as his own star continued to rise and rise, Damien completed the Oceanis 51.1 that G3 had started, and has now delivered the 46.1. Next will be something further down the line. I was fortunate enough to sail the magnificent Oceanis 51.1 with Damien in Spain last year. It is responsive, cleverly thought out, and the way is sends all the control lines to the helm is a true mark of her French origins, and makes the absolute most of Damien's skill set as a naval architect. Cats continue to gain more and more market share, which is not surprising. Stability, room, and functionality reign supreme. So as more and more former non-sailors take to the seas, they will only continue to be the choice for many. 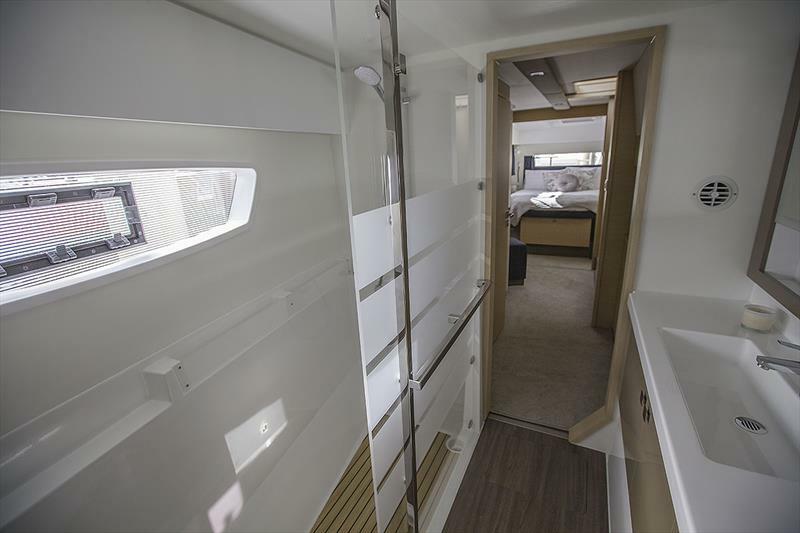 Multihull Solutions had the very new Fountaine Pajot Astrea 42 on display, and her owners were happy enough to let us all take a big look through and then go for a sail, as well. We'll have more to say about all of that later, but for now it suffices to say that the way she works with her new cockpit arrangement and that terrific swim platform/tender stowage is exceptional. You do forget that she is just 42 feet. Yet it is her dreadnought bows, in combination with shallower rocker, and then distinctive reverse sheer that makes the biggest statement on both the performance and aesthetic stages. I do feel that we have witnessed a redefining of the cat space with this craft. Now the surprise packet had to be a call from Italia Yachts, who had their 1298 on display. Franco Corazza was out from Venezia, where they make their glorious boats on the Southern end of the lagoon. Also penned by Cossutti, the Italia is a delightful blend of traditional sailboat, with absolute flare, that only the Italians could pull off. They do not build many, but each of the people involved in making them owns the company, so pride is evident everywhere. They are light for size, and going for a sail with the man himself was a highlight of the show period for me. Grazie Mille! OK. Today you will find that we have information for you about Rallies, a great piece on the Windward Isles, plastics, Spain, the Channel Islands, gear from Musto, the Great Barrier Reef, the South Pacific, wine and France (or is that France and wine? 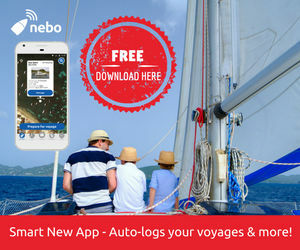 ), taking 18 years to build your own boat, the Hairy Bikers are going to be at the London Boat Show, and also how to get your free ticket, orcas, lobster pots, Whitsunday Holidays still have some accommodation for Hammo if your plans just changed or have late guests, as well as much more. 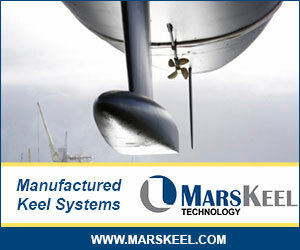 What is the Optimal Off-Shore Cruising Configuration? 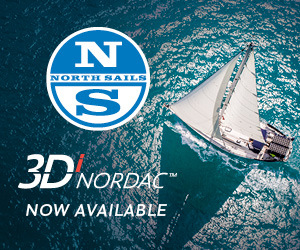 The sail improved the boat's performance in a breeze (note the bow wave) and dramatically reduced heel, making life much more comfortable. Tacking was an easy manoeuvre, because the sail did not overlap the mast. The UK Ship Register has qualified for one of the world's top standards because fewer than one per cent of it flagged ships being detained in United States of America ports. This year, we decided to go after the long Australia Day weekend, as it's great to support the SSCBC Three Piers Race, my favourite club passage race, which Sally and I sailed 2 up in Jessamine, coming second across the line to Morning Star. Ushant is the northwestern most part of Metropolitan France. The area around the island is considered one of the most challenging to navigate in the world with its many rocks and more than ten-knot tidal streams. It was an early start for the fleet as they slipped lines at 0500 and headed out of Dart Harbour to make the most of daylight for their 73nm passage to Guernsey. The first ARC Channel Islands South West Edition, in association with Hamble School of Yachting and the RYA got off to an excellent start as the 6 boats and 16 crew arrived at Darthaven Marina. Having been in Spain for just over three weeks now its been a real mixed bag, we have had uncomfortable large sloppy swell, flat calm seas, amazing rocky steep hilly shorelines, flat white stunning sandy beaches, plenty of fresh fish caught from the boat. 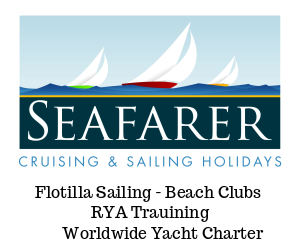 Have you claimed FREE ticket to TheYachtMarket.com Southampton Boat Show? Not only can members claim their FREE ticket to any day of the Show, members can also purchase up to three additional tickets at the special discounted rate of just £13.00 (a transaction fee of £1.95 applies for purchased tickets). WSI team will be on hand throughout the Show to answer any questions about the company's WEST SYSTEM® products. WSI's technical experts will be able to offer advice on visitors' projects and the use of epoxy for boat building, repair and maintenance. On Tuesday, August 14 at 8:00 PM, Seven Seas U presents a FREE webinar on cruising the Windward Islands.